Stark Raving Ted is another action shooter platformer zombie game on onlinegamer. In this game, the year is 2012 and apparently, the alien invaders attacked our planet and turned all of the humans into zombies craving for brains. You play as ted, one of the few survivors in the zombie apocalypse, unlike other survivors hiding in shelters, you find joy in kicking butts of these filthy aliens with a variety of weapons. 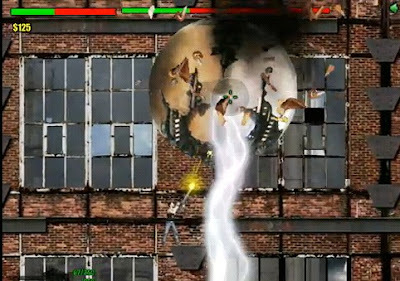 There are10 progressively challenging levels in this flash game each with amazing boss battles at the end. As for the guide, tips, hints, secrets and strategy you can see the series of (SRTw) Stark Raving Ted walkthrough for all levels after the cut.